Ask most homeowners if there is anything they dislike about their large windows, and invariably one of the top responses will be: cleaning them. This twice-yearly task is an often-dreaded part of home maintenance. Window washing sounds relatively straightforward, but professional washers use very specific techniques. Very few people know the best way to clean windows. Too many homeowners have invested time and effort into cleaning their windows only to realize on the next sunny day that streaks and grime still mar their view. To fully remove built-up dirt and grime from your windows, you need to use the right cleaning solution. The best window cleaning solutions are heavy-duty enough to provide results yet gentle enough to not damage window frames, trim or your home’s siding. Commercial solutions are available, but not necessary. Homemade solutions are inexpensive, more environmentally friendly and easy to make. Vinegar, especially white vinegar, is acidic. The acid helps to loosen stuck on dirt, tree pitch, and residue from previous cleaners. It also helps to minimize and avoid streaks. 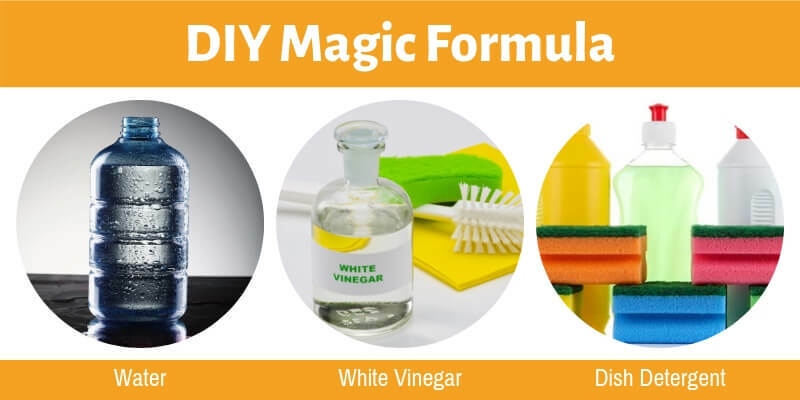 Many DIY cleaner recipes use water and vinegar. 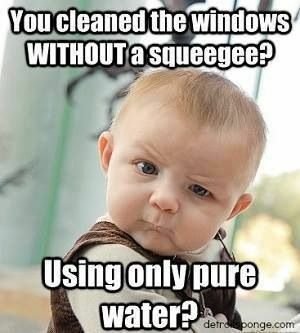 However, the addition of dish detergent is critical to window cleaning success. The dish detergent contains soap which acts as an emulsifier. The soap helps lift the loosened debris and allow it, as well as oils, to mix with the water. The whole mixture can then be rinsed off leaving behind a sparkling clean window pane. In a large bucket, mix 1 part white vinegar and eight parts water. Add roughly one teaspoon of dish detergent for every 4 cups of water. 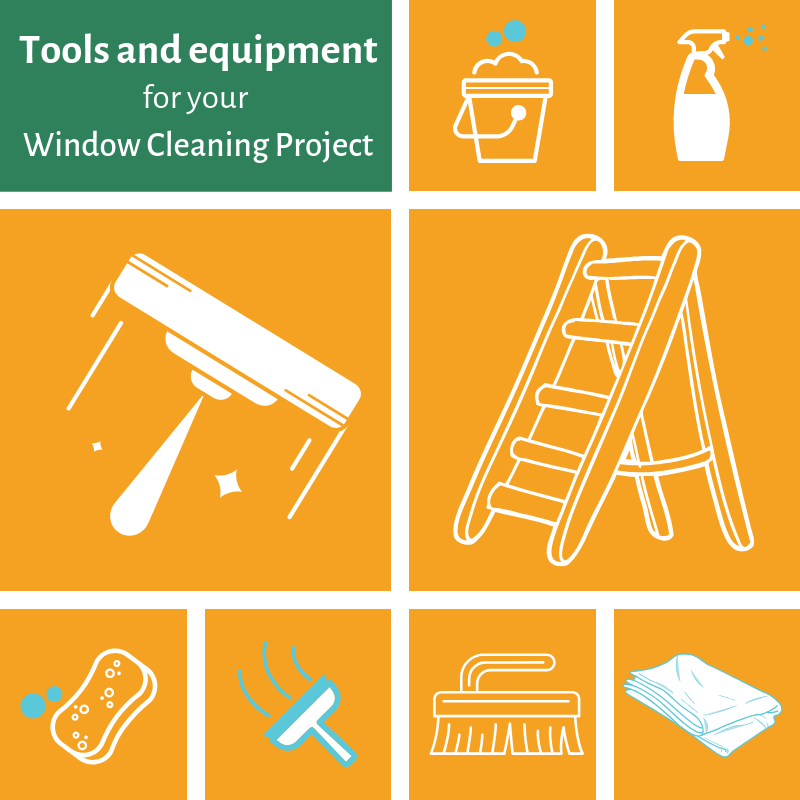 Before getting started on your window cleaning project, ensure you have all the tools and equipment you will need. The first tip professional window cleaners will give to schedule your cleaning for a cloudy day or a time of day when the windows are not in direct sunlight. The faster the window dries, the higher the likelihood that the cleaner will dry on the window before you can remove it. It is tempting to dive right into cleaning the glass because, after all, that is the part of your windows that is generally most noticeably dirty. Before tackling the glass, turn your attention to everything surrounding the glass. Your interior window frames are likely coated in a layer of dust. Exterior frames may have cobwebs, leaves, dirt and other debris wedged in the corners. Take care of these issues first so that you don’t drag extra dirt onto the panes when you are cleaning them. Use the soft-bristle brush to remove debris from your exterior frame gently. Wipe both the interior and exterior frames using a lint-free cloth and household cleaner. Now that your frames are clean, it is time to move on to washing your windows. Expert window washers make their technique look like a fluid dance. Watch them in action, and you will see that the best professionals don’t move their applicators and squeegees at right angles, but instead use an “s” or “snake” pattern that helps prevent streaking. Apply cleaning solution and scrub away dirt using the microfiber strip applicator/window scrubber (for picture windows) or natural sponge (for multi-pane windows). Remove cleaning solution using a wet squeegee and an s/snake pattern. Using a wet squeegee instead of a dry one will help keep it from skipping on the glass. Use a chamois cloth to soak up any residual water in the corners of the window. The panes are the first place we notice dirt since we look through the glass. That doesn’t mean that we are done cleaning once the glass is sparkling. Pair your semiannual window cleanings with your spring and fall window inspections. While you are cleaning the windows and frames, be alert for any of the signs that your window seals have failed or that your windows need to be replaced or repaired. Taking the time for proper cleaning and maintenance will pay dividends by improving the look of your home and extending the life of your windows. Mix up some cleaning solution, order yourself a deluxe squeegee and start practicing those “s” patterns. Your windows will thank you.